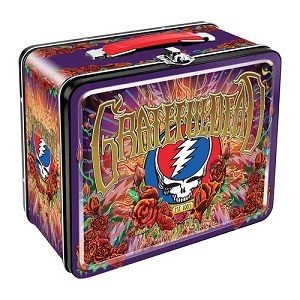 You or your kid will be the hit at lunchtime when you bust out your lunch from this Grateful Dead lunchbox. It features imagery from the 50th anniversary poster design on both sides of this cool lunchbox. This tin lunch tote measures approximately 7" x 8 1/2" and is official Grateful Dead merchandise. Love this lunchbox. I've anothr metal one with a coll '60s Hot Wheels design. Everyone loves it. But he metal is cheap and I had to replace the cheap handle hinges. In comparison this is not only cool looking & handsome with great GD embossed design, it'is strong metal and full lunchbox size (other on is a bit smaller). Handle appears sturdy, well made. Well made overall.